What no blog yesterday? No, it was Jam Making Day in our household and that took priority. 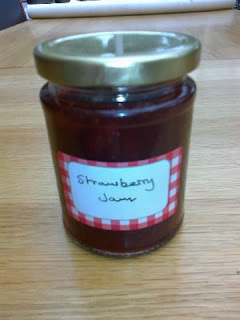 Stocking-up with homemade jam while fruit is plentiful, is always a pleasure and when I discovered that English Strawberries were only three punnets for £1 at Birmingham's open market over the weekend, then it was strawberry jam making time in our house yesterday. 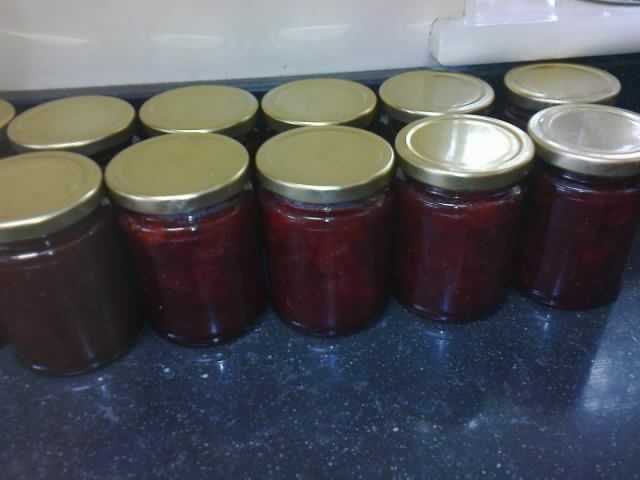 With 15 punnets for a 'fiver' we were able to produce 25 jars of beautiful tasty jam that will last all winter. 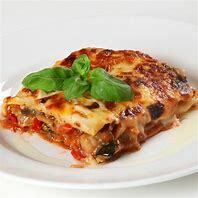 A simple recipe and hard work was all it took. 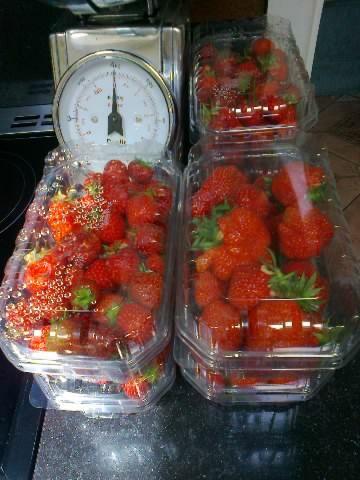 Approximately 1kg of strawberries will make 3 medium size jars of jam and they will keep for up to 9 months. 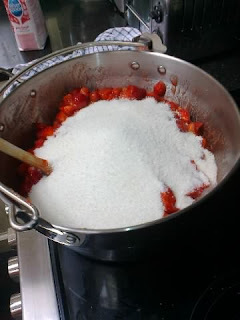 We use 900g of jam sugar and 6tbs of lemon juice per 1kg of fruit, which avoids the need to add pectin for setting. 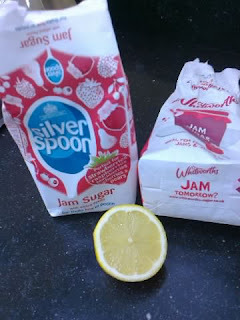 But alternatively you can use 6tbsp of strong pectin stock with granulated sugar. 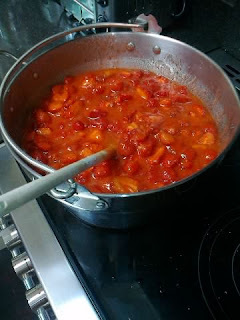 With the strawberries hulled and halved, put them and the lemon juice in a preserving pan or a large heavy saucepan and cook gently for 10 minutes or until the fruit is soft. 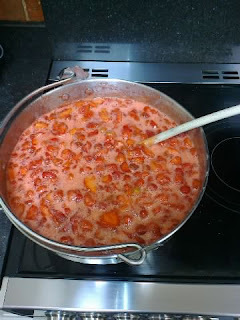 Add the sugar (and pectin stock, if using) and heat gently, stirring in the sugar into the fruit until it has all dissolved. Turn up the heat and bring to the boil. When the jam reaches a rolling boil, cook for 15 minutes or until it reaches the setting point (i.e. when jam thickens around the side of the pan and boils sluggishly and the bubbles 'plop' rather than froth). 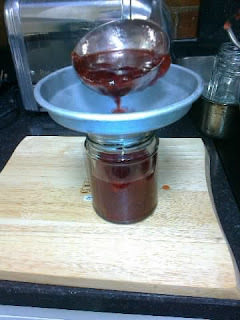 Remove from the heat and test for a set by putting some jam in a bowl, scoop up some jam with a wooden spoon, allow to cool for a moment, then tilt the spoon and if the last part of the jam falls in a flake rather than a stream, it is set. Use a skimmer to skim off any surplus scum on top of the jam. 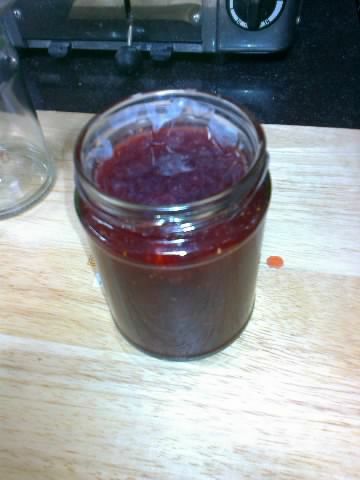 Leave the jam to cool slightly so that a thin skin forms and the berries are evenly distributed throughout the jam. Cover with discs of waked paper, seal and label. This classic soft-set jam is divine with thick cream and scones. It's scone-making this weekend, so i can't wait to try this jam!